Israeli killed 16 Freedom Flotilla activists: am I anti-Semitic if I disapprove? All the newspapers in the world are telling the news that about 16 people died under the bullets of Israeli soldiers who intercepted a ship, the Blue Marmara Ship (Marmara Mavi Gemisi) belonging to the Freedom flotilla made up by some international NGOs under the leadership of the Free Gaza Movement. Aboard these ships there are activists and humanitarian workers from all over the world, parliamentarians, UN officials, journalists, etc. This is not the first time that the Free Gaza Movement organize these trips (the debut there was in August 2008) to bring medicines, food and any type of support to the victims, I repeat again, the victims of this occupation. Because that one is an occupation. Think that those troublemakers of United Nations called a crime against humanity. The worst consequence is terrible and I don’t wants to mention. Israel will say that its soldiers fired in self-defense, because they were attacked by some terrorists infiltrated on the ship. In other words, the Israelis have the right to defend, and so on. Governments, politicians and good-thinking people all over the world once again will support this thesis. Am I anti-Semitic if I think it is inhumane to leave 30,000 people without water? Am I anti-Semitic if I consider cruel to allow 100,000 more to have it only every two or three days? Am I anti-Semitic if I define a crime to kill more than 300 children for defending? Am I anti-Semitic if I think that to endanger the health of one million and half people is an injustice? PS: Oh, I forgot that to complete the script it remains this: "Hamas is accountable. 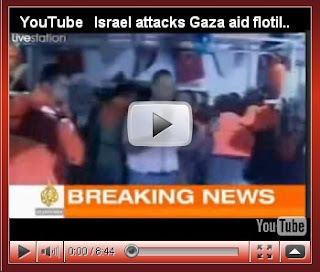 Israel has right to defend…"
The News: Israel attacked humanitarian ship.